Es kann sein das wir hier Bilder gefunden haben, die ein weiteres Exklusiv der Botcon 2015 zeigen. Es ist ein Repaint von Generations Arcee. Wir halten euch auf dem Laufenden. Niiiiicht übel!!! Ist das eine Hommage? Jetzt können wir euch Bilder zur BotCon 2015 Teilnehmer Bonus Figur zeigen. Es ist ein Repaint vom Transformers Generations Legends Skrapnel. dazu gibt es auch ein Repaint vom Generations Chop Shop in Blau und ein Silber Rotes Repaint vom Generations Reflector. Hier haben wir die Bilder zum BotCon 2015 Transformers Exklusiv G2 General Optimus. Er ist ein Repaint vom Generations Roadbuster. Das Waruder Set mit dem Generations Deluxe Waspinator Recolor in vier verschiedenen Varianten. Hier haben wir die Bilder zu einem weiteren Botcon Exklusiv. Es handelt sich dabei um den Toyworld Orion und den Toyworld Hegamon in einem Set, welches wohl als Convention Exklusiv gilt. Es kann also sein, das wir dieses Exklusiv auch auf anderen Conventions sehen. Dieses Exklusiv wurde von TFsource in Zusammenarbeit mit Toyworld gemacht. Die Figuren haben ein bisschen andere Farben, wie die originalen von Toyworld. So sehen sie mehr nach G1 Marvel aus. Hier haben wir noch einmal eine ausführliche Bilder Galerie zu den Botcon Souvenir Sets. Zu sehen sind General Optimus Prime, Sargent Hound, Diaclone Skidz, Diaclone Hoist und der Waruders 4er Pack. Jetzt können wir euch einige Bilder mehr von der Botcon 2015 zeigen. Hier noch einmal die Combiner Wars und die San Deigo Comic Con Exklusive. Jetzt zeigen wir euch die Bilder von der Hasbro Ausstellung auf der Botcon 2015. Hier u sehen RID, Kreo und Rescue Bots. Hier haben wir die Bilder vom Botcon 2015 "The Birth Of Transformers" Panel. Hier werden Bilder gezeigt, die nie gezeigt wurden. Es geht um die Entstehung der Transformers, über Diaclone und Car Robots bis hin zu heutigen Transformers. Zur Zeit läuft auf der Botcon 2015 das Habsro Panel. Hier haben wir schon mal die ersten Bilder. Als erstes gehtes um die Rescue Bots, Robots in Disguise und die Generations Toys. - Tiny Titans wave 1 in blind bags has a number of new guys, including Devastator. - Minicons are hitting shelves for the Fall and were introduced in episode 12. - Victorion, female combiner team, first ever will be added to Transformers. - She's not an ordinary Autobot, almost feels like a Wrecker with her own agenda, made up of 6 tough females who defy the world they're in. They're from the Sea of Rust, a misfit team of Autobots. - Ironhide, Mirage, Prowl, Sunstreaker, Legends Rodimus, and Voyager Battle Core Optimus is a white redeco of the Voyager Optimus. - All Wave 4 based on Kojin Ohno's designs from original G1. - Voyager Wave 4. Battle Core Optimus Prime, head based on Star Convoy. - He has the enigma of combination and a special armor on his body. - Deluxe Ironhide. Deluxe Mirage. Prowl. Sunstreaker. Each limb is a redeco but they all have unique heads. - We missed a pic of Ironhide but we'll get one from the case later, I'm sure. - Rodimus and Skywarp Legends wave 4. - The team acknowledges the mistransformation in the stock shot for Skywarp's wings. Shockwave inspired from the episode where Bruticus holds Shockwave. Also can peg into his back to give him power of flight. 19:36Don't worry, pics are coming. 19:35Legends tape Buzzsaw, Shockwave, Chop Shop, and Pipes from Huffer. 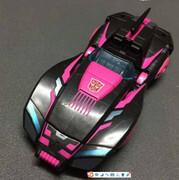 19:35Swindle is a new mold. 19:35Blast Off is an airplane, a VTOL. 19:34Brawl is an all-new mold. 19:34Made them this size because of fan feedback and comments over the years from previous Generations versions. 19:33Looking at each. Onslaught, is from Hot Spot with major remolding. Running change will have the G1 animated version. So you can get either show or toy deco. 19:32Vortex, Browl, Swindle, Blastoff, Legends class Shockwave, and Voyager Onslaught. 19:32Original combiners were Superion, Menasor Devastator...and Bruticus! 19:32Spring 2016. None of this has leaked, supposedly. 19:31Leader Starscream with the crown. Tried hard to match the gray with that of the original G1 toy. Will be in the booth later. Devastator being shown now. Comes out this Fall. Showing SDCC comic con exclusive and packaging. Took a while to get the green just right. 19:42Showing deco sheet and grey model, a bit of behind-the-scenes of development. Loyal Subjects on the next slide with a reveal of Devastator from them. 19:43Concept art being shown, with some of the sketching back and forth the designs as they work together to create it in a partnership. Originally had Windblade as an all gold deco. Showing some concept decos. Showing some of the concept art from Combiner Hunters. Question about whether the Seacons will come back. They agree that it's awesome, but no comments otherwise. Is the Kreo line dead in the US? There's still some product out there - stay tuned for more news in the future. That's the latest news. Question about a bunch of other combiners and whether anything else is coming. Breastforce, Tripredacus, Nexus Prime. No. Has 3rd party influenced Hasbro product? No. It's one of those things where they look at it, they see they have a tremendous fan base that is passionate and wants great products, so they want to deliver that for that audience. 3rd party not a factor. Also, in Generations we're doing products people love at a price that people can share with those that love them. Will we ever see GI Joe/Transformers crossover? Threw the question back to the audience. Lots of cheers. Some no's as well. Sounds like no plans, but there's story to do it and they like the concept, but it's never really fit. Jerry's mom just called him, and he's being teased about it. Question about the Titan Wars backdrop. Lots of feigning ignorance, "there's just more stuff coming, you just never know." Stay tuned, we're not ready to announce anything yet. Question about whether we can reliably count on seeing the later waves of Combiner Wars in stores. They say it's hard to make sure that everything gets out through the supply chain before the next thing comes in. They want to be sure they get out, and they're trying. Out of time. End of panel. Vielen Dank an allspark.com für den super Live Stream. Skylinx ist ja sowas von ein Muss...Bruticus vielleicht auch. gespannt bin ich auch auf den Legend Shockwave...hoffentlich gibs dazu auch ne größere Variante. Jetzt können wir euch die Bilder aus der Ausstellung von der Botcon 2015 zeigen. Ein großer Dank geht hier an TFW2005. Wow, der Bruticus übertrifft wirklich voll meine Erwartungen und Shockwave gefällt mir auch. Cool hoffentlich kommen Predaking und die andern Combiners. Bei RID fehlen glaube ich immer noch die Voyager und die Leader Klasse. Wie ich es mir dachte: Blast Off und Vortex sind Repaints und Brawl, Swindle und Onslaught sind neu, kann ich mit leben. Skywarp jetzt auch noch in Leader Class? OH HAPPY DAY!!!!! !